Does genetics limit our fitness potential? Can someone blame their lack of athletic ability to poor genetics? Are there really “super genes” which determine a person’s athletic success? Surely there is a reason why the Kenyan Olympic runner is almost always the fastest, or why are the white Europeans are always so good at the weightlifting competitions right? While it may be tempting to say that seemingly “athletically gifted people” have an advantage, is there really science to back that up? As children, most of us have memories of our abilities (or lack of) in P.E. whether they are fond memories or not. Some kids always seemed to be the fastest, the higher jumpers, or possess the crazy flexibility which makes gymnastics so easy for them. We may even see this in our own kids as well. Watch a Little League game for an hour, and I bet you will be able to pick out the “more athletic kids”. So are the rest of us doomed to athletic failure if we didn’t excel in sports as kids? Should we give up on all of our fitness goals now and go get a pizza? 🙂 Absolutely not! There are many factors that determine our success in fitness and sports. First of all let’s look at the science that does suggest that some people do possess more athletic genes. In my research I found varying statistics on the number pf performance related genes that scientists have found. Some say 23, 200 or even 300. DNA is very complicated and it seems to be the general opinion that it is the mixture of certain performance genes that may give some athletes an edge. Keep in mind that 99% of all humans possess the same DNA. We can’t be ALL THAT DIFFERENT right? So far, no single performance gene has been detected. If you really want to know if you are physically gifted there are genetic tests. Olympic athletes have used these, and there is even talk about giving the tests to children to see ahead of time which sports they will excel in – (that’s a whole other post topic, and my opinion on that is it is taking science too far. Just let the kids have fun). Anyway, this test screens for the ACTN3 gene. If someone has this gene they also have the protein alpha-actinin 3 which aids in letting muscles contract more p0werfully at high speeds. This protein is often found in Olympic sprinters. Stepping out of the microscopic world now, let’s look at some of the more physical traits which may indicate athletic ability. Believe it or not the stiffness of your tendons and the way muscle fibers connect to them determine the threshold of your jumping ability. Stiff tendons are springier and allow for better jumping. If your muscle attaches to the tendons at an angle, you will handle strength training better; whereas if they connect in a straight line you will most likely be a faster sprinter or jumper. Our level of flexibility is affected by our muscle spindles and the natural tightness of our ligaments. Did you ever wonder why the woman on the spinning bike next to you always seems to be able to keep the pace of the instructor without seeming very winded? Perhaps it is due to her own intense training outside of class, but there may be a deeper reason as well. Our cardiovascular capacity is affected by our lung size, heart size and the number of capillaries in the lungs and the muscles. We can increase our VO2 max (maximal aerobic capacity – basically the amount of O2 the body can use during exercise). Typically training can increase this number between 10-15%. Olympic athletes may increase it up to 30%. Body types may also give some an athletic edge. 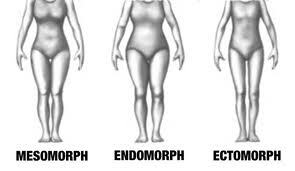 There are 3 basic body types: Ectomorpoh, Endomorph and Mesomorph. Ectomorph shapes are usually tall and thin, don’t gain muscle easily but are usually fast. Many runners have this body type. Endomorph shapes are typically softer, rounder and may gain weight easily. 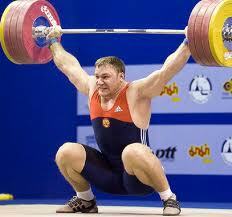 They can gain muscle pretty well too which may give them a weight lifting advantage. Mesomorph types are fairly lean, put on and lose weight fairly easily and gain muscle easily. They tend to look the most athletic naturally. To great examples of body types and there corresponding sports are the Kenyan runners and the Scandinavian weight lifters. Kenyan runners typically are ectomorphs with long limbs, narrow hips, high calves and small upper bodies – perfect running machines. Scandinavian weight lifters have shorter limbs, wider hips, more body fat and larger upper bodies naturally – perfect weight lifting machines. Now I know we can’t put everyone in the same box, but there are obvious genetic tendencies here that can’t be ignored. At this point you may have identified yourself in one of these groups. That’s okay to do and even a good idea I think, so that you know your body better. Even with all of the science and mechanics we have seen, there are many other factors which determine your athletic success. Many of the traits we have looked at do seem driven by genetics but not completely. Environment and training have a lot to do with it. Those Ethiopian and Kenyan runners live and train at altitudes over a mile high – guess how that trains their lung capacity? Many athletic traits like power, explosiveness, endurance and flexibility are trainable to some extent. Since most of us are not looking to enter the next Olympics, we should train and strive to be the best OUR bodies can be. Most people never achieve the highest physical potential their bodies possess. This could be due to lack of time to train, lack of knowledge on how to train or simply the lack of motivation. Someone with “natural athleticism” who sits on the couch all day will be surpassed in the fitness sense by someone who is less “athletically inclined” but trains to their full potential. Our bodies are all unique and have unique physical characteristics. Acknowledging areas of strengths and areas to improve helps us reach our full potential. Let’s never underestimate the power of our minds and outlooks on our fitness success. 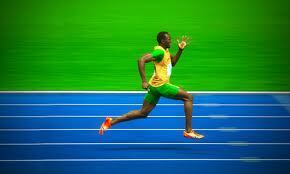 Mental focus and determination can drive anyone body type to become a better runner, weight lifter or sprinter. Train hard and consistently and you will see improvements despite genetics. We should use our natural strengths with our mental strength to become the best athletes we can be! I’m pretty sure I’m in the endomorph category. Weight lifting competitions here I come! Ha! « Welcome guest blogger Bridgette Sandorford!